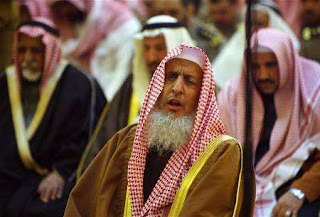 Old Saudi Wahhabi clerics are American allies in the war against ISIS. Young Kurdish feminists and female fighters are not American allies in the war against ISIS. Saudi Arabia, Turkey, and Israel, the three biggest allies of the United States in the Middle East, have made it clear, sometimes subtly, and sometimes not so much, that they have no interest or desire to engage ISIS militarily and halt its momentum. Their neutral stance makes total sense since the governments of these countries have played a big role in nurturing ISIS and helping it grow to become the regional genocidal menace that it is today. The fact that old Saudi Wahhabi clerics are U.S. allies in the war against ISIS, and young Kurdish feminists and female fighters are not, is all you need to know to understand how screwed up and farcical Washington's Middle East policy is, and there is no spin that Barack Obama, the Bullshiter-in-Chief, can resort to at this late hour to make his administration look good. The reality is that the U.S.-led Middle East order is going to hell. Washington's key allies, Saudi Arabia, Turkey, and Israel are welcoming this new chaotic reality. In effect, they are saying, "A chaotic hell with genocidal ISIS butchers reigning is better than regional stability with Shiites and Kurds reigning." Be careful what you wish for, because the fires of terrorism and sectarianism will burn these kingdoms and countries down just like Iraq and Syria. No country in the region is immune from the plague that is ISIS, especially not the ones that spawned them in the first place for foolish and short-sighted reasons. "The Sunni powers are nervous about the Islamic State but skeptical of throwing in with the United States unless there’s a real commitment to securing more Sunni political representation in Iraq and more support for moderate rebels fighting the Assad regime in Syria. The Americans counter that the Sunni leaders also have room for improvement, starting with the need to crack down on the networks that send money and fighters from the Persian Gulf states to the Islamic State, which now controls roughly half of Iraq and a third of Syria. “Without us having some skin in the game, it’s not clear that all the parties would play their assigned roles,” said Gregory Gause, a Persian Gulf specialist who heads the international affairs department at the Bush School of Government and Public Service at Texas A&M University. “The Iranians would be fighting these guys anyway, but the Turks might say, ‘We have to do a deal with them if they control all this territory.’ And the Saudis might say, ‘These guys are bad, but they’re fighting Assad and Iran.’”"
The US and its allies face a huge dilemma which is largely of their own making. Since 2011 Washington’s policy, closely followed by the UK, has been to replace President Bashar al-Assad, but among his opponents Isis is now dominant. Actions by the US and its regional Sunni allies led by Saudi Arabia, Qatar, Kuwait and Turkey, which were aimed at weakening Mr Assad, have in practice helped Isis. The 560-mile-long Turkish-Syrian border was left open by Ankara for jihadis to cross, enabling 12,000 foreign recruits to join the rebels, most becoming part of Isis. The US is now desperately trying to persuade Turkey to close the border effectively, but so far has only succeeded in raising the price charged by local guides taking people across the frontier from $10 to $25 a journey. So far it looks as if Mr Obama will dodge the main problem facing his campaign against Isis. He will not want to carry out a U-turn in US policy by allying himself with President Assad, though the Damascus government is the main armed opposition to Isis in Syria. He will instead step up a pretence that there is a potent “moderate” armed opposition in Syria, capable of fighting both Isis and the Syrian government at once. Unfortunately, this force scarcely exists in any strength and the most important rebel movements opposed to Isis are themselves jihadis such as Jabhat al-Nusra, Ahrar al-Sham and the Islamic Front. Their violent sectarianism is not very different to that of Isis.